« Just who’s having this baby? One of the best parts of being a SU demonstrator is meeting the other lovely people that are SU demonstrators. One such lovely person is the lucious Linda Higgins from the central coast area of NSW. I’ve had brief chats to Linda at convention etc and she’s just the most delightful and talented lady! So when I was asked to do an SAS recently at short notice I had a whip around my fave sites for inspiration. 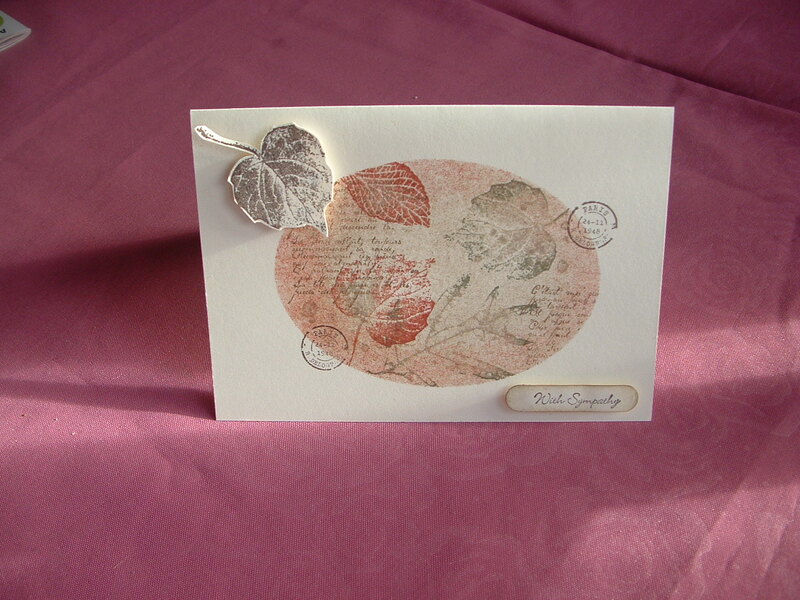 Linda had used this sensational stamp set French Foliage and I loved what she had done with it. So changed the shape a little and copied the remainder a lot! Thanks Linda! I’ve used the good old technique of Reverse Masking. It never fails to supply the WOW factor to me, and lends itself to this technique wonderfully. The sentiment is from Teeny Tiny Sentiments and the girls just changed the greeting to whatever they wanted. Of course the word window punch was used so that no sentiments were crooked. What a great tool that punch is!!! !